This article covers 5 free online sequence diagram maker websites. A sequence diagram is used to represent the object interactions arranged in time sequence. It shows all the classes and objects involved in the scenario and interaction between them. 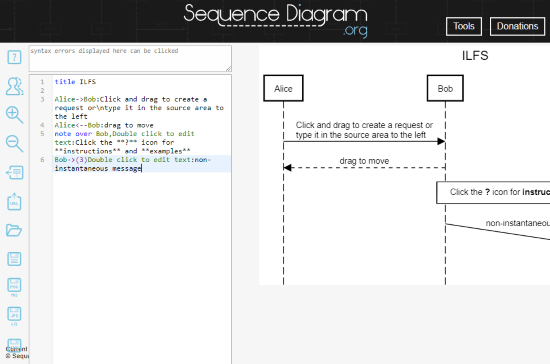 Here are 5 free online sequence diagram maker websites. With these websites, you can draw sequence diagrams online and download them to your computer. There are two types of sequence editors in this list. First three websites are online diagram editors where you can make the diagram using drawing tools. Whereas, the last two websites make the sequence diagram using UML programming. So, let’s check out these websites one by one. The first sequence diagram maker website on this list is Draw.io. It is an online diagram editor where you can make various types of diagrams. The process of creating a diagram is very simple here. This editor packs all the shapes you need for a sequence diagram under UML shape tab in the shape library. From there, you can drag and drop those shapes to the canvas and design your diagram. After adding a shape to the canvas, you can customize it as per your needs. You can change its dimensions, size, and customize its appearance by adding colors. After making a sequence diagram with Draw.io, you can export it as a PNG, JPG, PDF, SVG, XML, HTML, or VSDX file. You can download it to your computer or export it to a cloud storage. Draw.io supports Google Drive, OneDrive, Dropbox, Trello, and GitHub; you can import/export files to these platforms right from the editors. You can also generate a shareable link and share your diagram with a controlled audience. 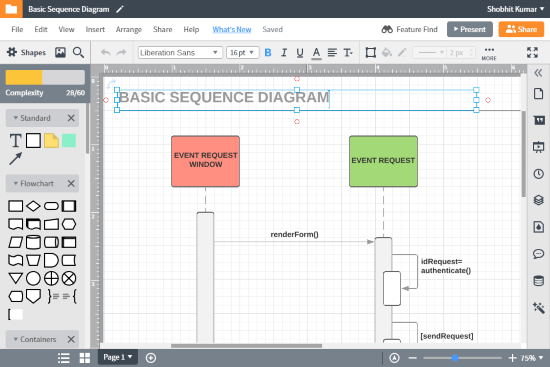 Create sequence diagram online with Draw.io here. 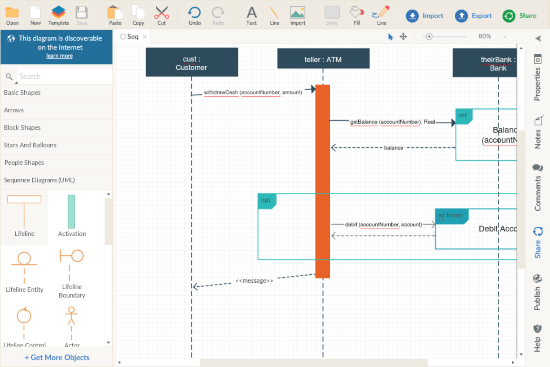 LucidChart is another online diagram editor where you can easily draw sequence diagrams online. Unlike Draw.io, LucidChart is a freemium service where you can use the basic features for free. And, those basic features are more than enough to make and export sequence diagrams here. This editor offers sequence diagram templates which you can edit to make your diagram. It also has a dedicated set of shape for UML sequence diagrams. You can add these shapes to the canvas from the shape toolbar with a simple drag & drop. After adding a shape, you can change its size and fill it with color. Making connections between these shapes is also easy. Simply click on a shape, this will show you four red dots on each side of the shape. Select any of those dots and drag them to the other shape where you want to connect it. This way, you can easily make sequence diagram with this online editor and export them to your computer as a PDF, JPG, PNG, SVG, or VDX file. Try LucidChart to make sequence diagram online here. 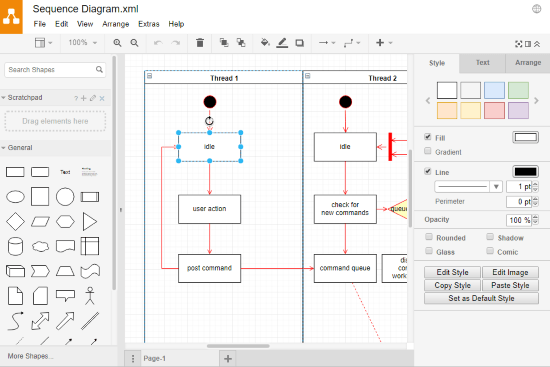 Creately is a freemium online diagramming tool where you can make sequence diagram and export it as JPG/PNG for free. It also supports export to other formats such as SVG, PDF, etc. but you have to subscribe to a premium Creately plan for that. Making sequence diagrams is very easy with this tool. It packs over a dozen UML sequence diagram templates to get you started. On top of that, it also has a separate section of sequence diagram shapes which you can use to start drawing a diagram from scratch. These shapes are fully customizable; you can resize and rotate them, change their color, and reposition them along with all their current connections. This way, you can easily make sequence diagrams with this tool and download them to your computer. Creately also generates two shareable URLs; one for view only and one with editing permissions. With these URLs, you can share your diagrams with others and add collaborators as well. Try this online sequence diagram editor here. 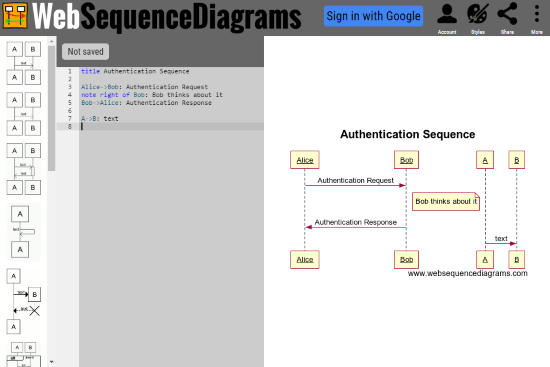 SequenceDiagram.org offers a powerful yet simple to use tool to make sequence diagrams online. Instead of offering drawing options this tool uses UML programming to draw the sequence diagrams. The interface is divided into two sections; one for the diagram preview and other for the UML code. On the left side, it has a toolbar. The toolbar has a module to quickly add a participant to the diagram. After adding the participants, you can either write the code or mouse cursor from one participant to other to add a connection between them. And, if you have a UML diagram saved on your computer, you can load it here and customize it accordingly. After making a diagram here, you can export it as a PNG, JPG, or SVG file. This tool also generates a URL to your diagram which you can use to share your diagram with others. You can try this online sequence diagram maker website here. WebSequenceDiagrams.com is another online sequence diagram maker tool that takes input in UML programming and generates a diagram for that. Unlike SequenceDiagram.org, this tool has a set of pre-defined modules which you can to your diagram with a single click and modify them accordingly. This is a freemium tool where you can make simple sequence diagrams for free and export them as PNG or TXT files. If you subscribe to their premium plan, you can also export to PDF and SVG format and unlock other features such as simple signals, changing the order of participants, signal to self, grouping signals together, notes in the diagram, and more. Give this online sequence diagram maker website a try here. These are the 5 free online sequence diagram maker websites. With these websites, you can make sequence diagrams online and export them to your local storage.